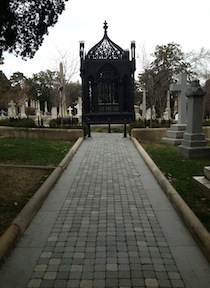 The grave of James Monroe sits in a cage on the crown of a knoll in Richmond’s Hollywood Cemetery. The ornate metalwork that holds him in looks like an oversized birdcage, although whether it’s to keep grave robbers from plundering Monroe’s sarcophagus or to keep Monroe’s spirit from flying away still remains unclear to me. Monroe’s gravesite sits center-circle, with walkways radiating outward and clusters of other graves crammed around. 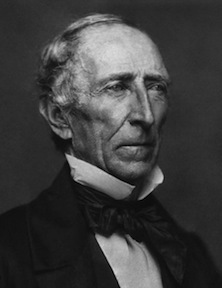 One of those is that of another chief executive, John Tyler, the 10th president of United States. Relatively obscure, Tyler is best known as the first vice president to ascend to the presidency because the elected president died in office (thus earning him the nickname “His Accidency”). A principled man during office, he nevertheless failed to achieve renomination by his party, which at one point even threatened to impeach him. I have often wondered about Tyler’s prominent placement so close to Monroe. True, as ex-presidents, they both deserve respect, but Tyler’s sun never shown as brightly as Monroe’s. In fact, once out of the White House, Tyler’s popularity sank so low that his neighbors deliberately elected him commissioner of roads as an insult–a position he had to accept or pay a fine. Tyler won election to Virginia’s secession convention, where he served as chair, and later won a seat in the new Confederate Congress. Like John Quincy Adams serving his post-presidential years in the United States Congress, Tyler’s presence in the Confederate Congress gave him extra stature. At the time of his death on January 18, 1862, he was enjoying newfound heights of popularity across the state. Tyler’s death came rather unexpectedly (although his wife had come to Richmond to see him just a day earlier after having a premonition of his death). He laid in state in the Confederate capital and was buried with honors in Hollywood Cemetery near his predecessor, Monroe. 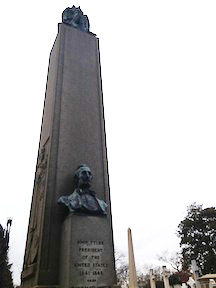 While his gravesite is not nearly as elaborate as Monroe’s, the tall obelisk and patinaed bust certainly indicate the public’s high esteem for him–well, at least in Virginia. On Presidential Circle today, Monroe and Tyler have plenty of company, although none of it presidential (Jefferson Davis, if one wants to consider him presidential, lies elsewhere the cemetery). Monroe’s caged grave is impossible to miss but Tyler’s obelisk blends in with the others scattered across the knoll. 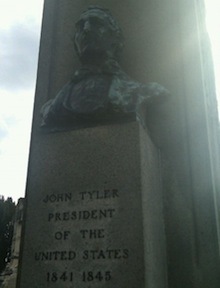 A bust of Tyler adorns the front, though, overlooking the main walkway that brings visitors to the circle—his impassive face impossible to read. Imagine, indeed, had that “hero” acted more heroic in his country’s darkest hour. How much misery might he have prevented? How would we remember him today? This entry was posted in Antebellum South, Leadership--Confederate, Personalities, Politics and tagged Hollywood Cemetery, James Monroe, John Tyler, secession. Bookmark the permalink. A bit of trivia that some may not be aware of is that Tyler has two living grandsons. Harrison Tyler lives at the family estate, Sherwood Forest, in VA, and Lyon Tyler lives in TN. Both are in their 80s. To think that someone born in 1790 could have living grandchildren is amazing to me!